This is the first public photo of Princess Leonor, future queen of Spain, taken as her mother carried her out of the Ruber International Clinic this morning after a week in hospital. Hundreds of photographers waited all morning to get their first camera shot of the baby since she was born last week. 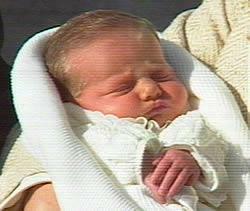 It is also the first time her mother, Letizia has made an appearance before the press since the birth. She has stayed in the rooms made available for her and her family in the Clinic all week, accompanied day and night by Prince Felipe and most of the time by her mother too. Queen Sofia has visited most days and is said to carry her new grandaughter’s photo on her mobile phone. On Saturday she and Letizia’s mother and grandparents spent the whole day in the Clinic. Yesterday was the first day since the birth that the royal couple and their new baby received no visits. Meanwhile Leonor’s arrival has speeded up the long awaited constitutional change in Spain to allow female royal descendents the same hereditary rights as males. The Spanish vice-president confirmed last Friday that the Socialist Government intends to initiate the process necessary to modify the article referring to succession to the Spanish throne from male-preference primogeniture in favor of lineal primogeniture. The Popular Party also supports the proposed change. Meanwhile the latest public opinion poll carried out by Cadena Ser today confirms the current crisis of the Socialist government. Support has slidden down to an all-time low, and according to the results of the pulsometro poll, if elections were held today the Socialists would not win a majority nor have enough support to form a government. The PSOE party has a lead of just half a point over the Popular Party, and since the parliamentary debate on the Catalan Statute last week, the popularity of Rodriguez Zapatero has fallen by 4 points whereas that of Mariano Rajoy, leader of the opposition, has risen by the same number. The past few months have been the worst of this government, and with unemployment rising, the intensity of strikes increasing (the miners have been on strike for the past week, following damaging strikes by the fishing and transport industries in October), the issue of the Catalan statute unlikely to go away, and the drought in Spain where government policies on water administration have divided regions and public opinion, things are not likely to get better in the short term unless their is a change in the socialist government’s style, personalities and policies. Spains new President promises to introduce a new political style to Spanish government.